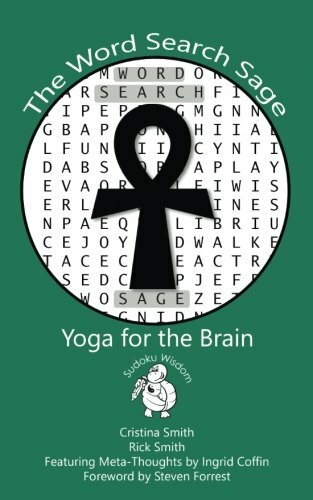 With “The Word Search Sage: Yoga for the Brain,” lifelong puzzle solvers, Cristina and Rick Smith bring us the third installment in their Sudoku Wisdom Series. This time, they have created a brilliant compilation of traditional word searches that reveal contemplative messages developed by spiritualist Ingrid Coffin. Each word search puzzle is preceded by a short passage that presents a specific self-help topic such as: ways to simplify your life, incentives for becoming your dream and the art of acceptance. Once the puzzle is completed, the remaining letters form a secret message or Meta-Thought. These Meta-Thoughts connect back to the passage and can be described as the deep “a-ha” realizations that surface in times of stillness. Interspersed between the sections of searches are expanded readings that complement the authors’ individual themes. These not only break up the games, but also cement the book’s central purpose, to evoke wisdom. By integrating philosophy with logic, the authors are truly boosting the brain in a most ingenious way. The publication contains 60 word search puzzles that range from easy to mildly difficult. The levels progress smoothly and provide plenty of challenge. In the book’s introduction, the authors offer different strategies for approaching the searches and stretching the mind. They also ask readers to pay particular attention to the words they are drawn to when solving these puzzles.